Joe Kraft is a working artist in Chicago, IL. He received his BFA from the New York State College of Ceramics at Alfred University in 2012. Upon graduation he received a Windgate Fellowship Grant and spent time traveling the Southwest to experience and research Land Art. Growing up in Illinois he wound up in Chicago soon after. He has been an artist in residence at Lillstreet Art Center, the AIR Ceramic Center in Vallauris, France and Guldagergaard International Ceramic Research Center in Denmark. While his primary medium is clay, Joe’s practice is rooted in drawing, which drives all other parts of his artistic work. I use clay to so I can draw 3-dimensinally. I take my secure and real state of being and reimage it through mark making. These marks, scribbles and loosely drawn lines interpret the way I see the world. Maeve Mueller is a Cambridge, MA based artist. She is both a staff member and teaching assistant at Harvard ceramics in Cambridge. She studied at SAIC, where she met fellow visiting artist Anna Schachinger. Maeve's work has primarily been functional vessels and ceramic jewelry, but she is currently exploring her developing interest in carved, sculptural forms in her time with us at ASP. More information on Maeve's work in links section. Nicholas Nyland (b.1976) is an artist living in Lakewood, Wa. He holds a BFA from University of Washington, Seattle, and an MFA from University of Pennsylvania, Philadelphia. Nicholas has worked and exhibited his paintings and sculptures internationally and was a 2013 recipient of the Contemporary Northwest Art Awards. He is a member of SOIL Artist Collective, in Seattle, where he exhibits regularly. At the Ash Street Project, Nicholas created a prolific body of work that included platters and mirrors, which were paired in an exhibition with Luke Armitstead's colorful sculptures and planters. Luke Armitstead was born in 1989 in Seattle, WA. He received a BFA in 2011 from the School of the Art Institute of Chicago, completed a Post Baccalaureate In Ceramics at University of Wisconsin, Madison in 2014 and just finished a two-year residency at Pottery Northwest, in Seattle. Luke has primarily been working in Ceramic Sculpture, yet also works as a painter, and designer. His work is intuitive, colorful, and abstract, however it is often fueled by concepts that seek to relate to, or interact with people, landscape, and design. Luke has shown in a number of Galleries through out Chicago, New York City, London, Seattle, and the Midwest. Rimas VisGirda began his academic career in science, earning a degree in physics from California State University at Sacramento. He later received a Master of Arts in Art degree from the same university, and completed a Master of Fine Arts in ceramics and sculpture at Washington State University. He has exhibited his work, given workshops in ceramics, and lectured internationally. He is represented in over 30 public as well as numerous private collections. His work is pictured in many books on ceramics as well as periodicals in the field. He has taught at colleges and universities on the west coast and in the Midwest since 1973. He retired from full-time teaching in 1997 and currently resides in scenic Champaign, Illinois where he collects fortune-telling cups, is a home-dad for sixteen year old Tadas and thirteen year old Jonas …and tries to maintain a studio. Mic Stowell is an artist living and working in South Minneapolis. After twenty-six years of full-time teaching he is now (almost) working as a full-time artist. Stowell’s work has gone through multiple iterations from slip cast geometric teapots to tightly painted plates and organic forms. Recently his work has evolved from dual interests in the figure and landscape, and reflects his interest in a range of contrasting surfaces. He is an adjunct professor at the University of Minnesota. Stowell is a 2017 McKnight Fellowship recipient. Working deftly across mediums and materials, Malia Jensen uses animals as the primary protagonists for her sculptures, videos, photographs, and works on paper. With great attention to the formal qualities of each of the materials she uses—like bronze, ink, soap, and salt licks—Jensen creates beautiful works invested with human emotion, as she describes: “There’s a deep sadness in a lot of the work. It’s like finding a human condition in an animal parallel.” This condition is one of (unsatisfied) sexual desire, awkwardness, fragility, and peril. In Bathing Skunk (2000), for example, Jensen cast a skunk taking a bath out of soap. By bathing itself, the skunk negates its identity by masking its signature odor—a defeatist and, for Jensen, all-too-human act, suggestive of the pathos of self-effacement and the stinging experience of shame. Jensen received her BFA from Pacific Northwest College of Art in Portland, Oregon. She has exhibited work with the Portland Institute for Contemporary Art; The New Museum, New York; the Tacoma Art Museum, Washington; the Holter Museum of Art, Helena, Montana; the Portland Art Museum; the Maryhill Museum of Art, Goldendale, Washington; the Mesa Arts Center, Arizona and the Melbourne International Arts Festival, Australia. I make pots as a method of communication with and contribution to the evolution of human civilization. As my investment in the pottery process began to take hold I dug into history, embracing the relationship between man and clay and fire. A connection was struck the day I happened upon a grainy black and white photograph of a medieval Syrian pot that bore a striking resemblance to something my fresh and sophomoric hands had made earlier that day. Just a sloppy little form with ambiguous anatomy, a wobbly foot, a lumpy belly, a twisted neck, finishing with a pouring edge raised by the happenstance of an imperfectly pulled wall. In that moment I reached across an ocean and thru time to make a connection with this Syrian potter and his lumpy little pot made a millennium ago. Imagining the longevity of the lumpy little pot in my own studio and its potential to communicate with others I felt that I had become part of something large and important. My investigation as a maker of pottery continues to be informed by this experience. For more on Steve and his work, click here. Adrienne Eliades is a studio artist currently living in Vancouver, Washington. She has been extremely fortunate to move all over the country for her work. 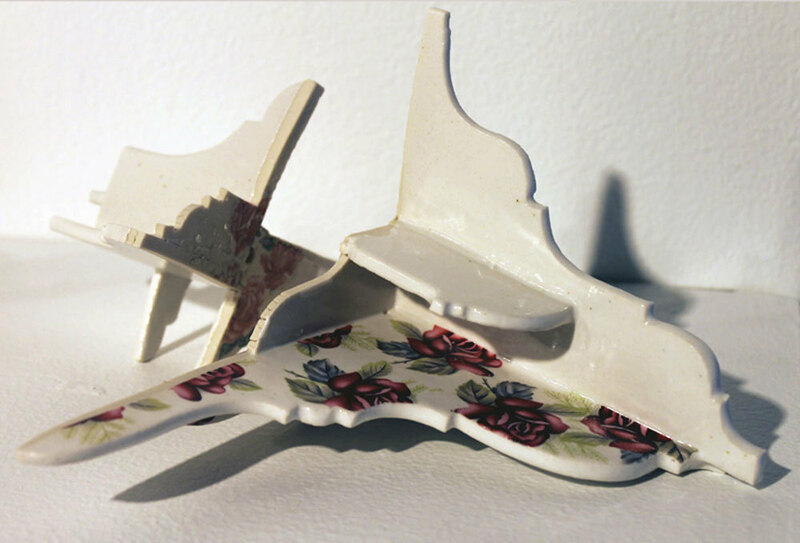 Previously an artist-in-residence and Ceramic Technical Specialist at San Diego State University for two and a half years, Adrienne more recently received her MFA in Ceramics from the University of Florida in May 2016. Her work has been on exhibit nationally as well as locally, engaging her community by hosting events such as The Food Experience and Kindred Confection. She explores the aesthetics of design and social dining experience. Propelled by her research of 20th century domestic spaces, Adrienne strives to reinvent mid-century patterns and construct social dining experiences. Jessica Jackson Hutchins is a Portland, Oregon based artist who is currently working with us at Ash Street Project. Her work varies from collage, painting and large-scale sculpture to installation. Jessica shows nationally and internationally, with an extensive resume which includes the 2010 Whitney Biennial and the 2013 Venice Biennial . As evidence of the artist’s dialogue with items in her studio, these works are a means by which the artist explores the intimacy of the mutual existence between art and life. Her transformations of everyday household objects, from furniture to clothing, are infused with human emotion and rawness, and also show a playfulness of material and language that is both subtle and ambitious. Based upon a willingly unmediated discourse between artist, artwork and viewer, Hutchins’s works ultimately serve to refigure an intimate engagement with materiality and form. Hutchin's work is about the domestic sphere and human interaction with forms acting as substitutions for the human form.The furniture pieces used in her work were once in her own home...Her ceramics (steeped in a California funk attitude), papier-mache sculptures, and collages share a crass aesthetic and a preoccupation with the thin line between disaster and success that disguise a genuine attempt to convey ideas about communion, fear, and loneliness. Jessica will be exhibiting new work in our gallery space in March for NCECA 2017. Eva Kwong is an artist and educator living in Ohio. Born in Hong Kong, Eva moved to New York when she was a teenager. Though she has worked in a variety of mediums, she is best known for her colorful, organic stoneware sculptures and installations. (Eva) attended the High School of Music and Art and considered art as her second language. Her work at the Nature Lab at RISD as an undergrad immersed her in the diversity and similarity of objects from nature. Her longtime interest in the intersection of the art and science of the natural world provides the conceptual framework for her compelling, colorful and sensuous organic forms. Eva was associate professor at Kent State and is currently a Visiting Professor at University of Akron in Ohio. In addition, she has conducted workshops at Anderson Ranch, OCAC, Penland, Arrowmont, RISD, and completed residencies at Oregon College of Art and Craft, Cranbrook Academy, Rhode Island School of Design and the Archie Bray Foundation. Though Eva has worked in a variety of mediums, she is best known for her colorful, organic stoneware sculptures and installations. Her work has been exhibited internationally and is included in collections at Shigaraki, The Mint Museum, The Finnish Craft Museum, and the Minneapolis Institute of Art. She is recipient of numerous awards and fellowships, including several Ohio Arts Council Fellowships. Please visit our community & events blog on this site as well as our Facebook page for updates on lectures and events related to Eva's visit. Jean-Nicolas Gerard is a potter from Valensole, France. The Ash Street Project had the good fortune to share our studio with him for the month of November. During that time, he experimented with Thomas' iron-rich terra-cotta clay body, slips and commercial underglazes, to develop a body of work with a palette vastly different than the lead-glazed work he creates in France. He was pleased with the results and we all look forward to his next visit and more experimentation. For a video about Jean-Nicolas and his work, please click here. "When creating a body of works such as this one, Jean-Nicolas gathers enough pieces to decorate them serially, so as to wear out his gesture with the brush and acquire some automatism...so is summoned unconscious,permitting the repetition required to enable creation. He juggles with influences (such as painters Henri Matisse and Pierre Alechinsky) while creating his own vocabulary. A knife or sharp instrument help him draw sgraffito lines directly on and inside the clay. In the plates, the rims often play the part of integrated frame. The pictorial surface goes all round the piece melting with the essence of the clay." Please see the community section of this website for a blog post and more pictures from our time with Jean-Nicolas. Dan Anderson and Jason Sturgill, Father/Son-in-law, were invited to Ash Street Project to do a collaborative, short-term residency. Here is a short bio on both Dan and Jason. Dan Anderson is currently a full-time studio artist following 32 years of teaching ceramics at Southern Illinois University Edwardsville. He now holds the rank of Professor Emeritus. Anderson received his BS in Art Education fro the University of Wisconsin-River Falls and his MFA in ceramics from Cranbrook. He is a NEA individual artist fellowship recipient, in addition to having been awarded six artist fellowships from the Illinois Arts Council. An avid wood firing enthusiast, he has his own wood kiln at his Old Poag Road Clay and Glass studio/home in rural Edwardsville. Dan was a resident artist at the Archie Bray Foundation in Helena, Mt in 1996, as well as an Artist Invites Artist short-term resident at Red Lodge Clay Center in 2010, 2012, 2014 in Montana. His work is represented at: Red Lodge Clay Gallery, Trax, Akar, Gail Severn Gallery, The Works, Plinth, Shaller and Nevica Project. Dan's work is in numerous private and public collections throughout the United States and Internationally. Jason Sturgill is an illustrator, designer and educator based in Portland, Oregon. His background is in advertising, graphic design and curation. Jason holds an MFA from Portland State University in Art and Social Practice. Jason has has worked for Nike, Laika, Dark Horse Comics and Wieden and Kennedy, and currently teaches at Portland State University. Please visit Jason's website to view a portfolio of projects he has designed/executed over recent years, too numerous to name here. Ash Street is thrilled to have Dan and Jason with us for several weeks. Please see Community Events blog for a write up of the experience. Drew Cameron is a hand papermaker, printer and book artist based in San Francisco, CA. He has a degree in Forestry from the University of Vermont and served in the US Army from 2000-06. His love for paperworks began as a teen, but was rekindled under the mentorship of Drew Matott in 2004 at the Green Door Studio Artist Collective in Burlington, VT. Drew was the managing director of Green Door from 2006-10, co-founder of Combat Paper in 2007 and partner of People's Republic of Paper, LLC. His current and ongoing work with Combat Paper and as a partner in the Shotwell Paper Mill in San Francisco is practicing and teaching the art and craft of hand paper making and encouraging others to do the same. The Combat Paper Project is based in San Fancisco, with affiliate paper mills in New Jersey, New York and Nevada. The project has traveled to Canada, England, Scotland, Northern Ireland and Kosovo, providing workshops, exhibitions, performances and artists' talks. Combat Paper is made possible through the collaborative effort of artists, veterans, volunteers, colleges and universities, art collectors, cultural foundations, arts spaces, military hospitals and installations. Miles Spadone is an artist and designer who lives and works in Portland Maine. He graduated form the Maine College of Art in 2013 with a BFA in Ceramics. His work blends the study of materials, the process of prototyping, and the utilization of production techniques to create objects of beauty and function. Most objects are made primarily in clay and gypsum, but relies heavily on wood-working techniques to explore preliminary ideas and concepts. Prior to Maine, he studied at Montana State University and Oregon College of Art and Craft. Cathy Bloom received her BFA in sculpture from Rhode Island School of Design in 1979, where she concentrated primarily on metal fabrication. After graduating, she worked as a graphic artist in New York city, while continuing to make sculpture and 3-D artists' books using wood, paper, plexiglass and paint. Matt Causey earned his BFA in Applied Media Arts with a minor in Printmaking at Edinboro University of Pennsylvania in 2000. He did his post-baccalaureate work at the Oregon College of Art and Craft in 2006 and received his MFA in Studio Arts from Cal State University, Long Beach in 2010. Matt will be working at Ash Street in Conjunction with his show with Lauren Mabry at Eutectic Gallery. For more information about Matt, please visit his Brian R Jones Podcast or read more from the Garth Clark C Files write up here. Jennifer Anable is a visual artist whose work explores the dysfunction of reality through a process based studio practice. 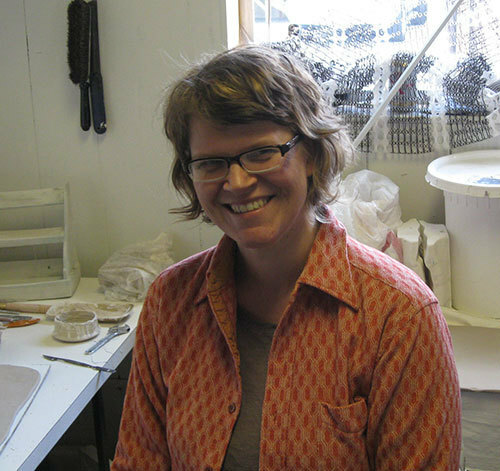 Jennifer received her BFA from the Oregon College of Art & Craft in 2002 with a focus on ceramic and earth materials. In 2004 Jennifer worked for a year at The International Ceramic Research Center in Skaelskor, DK, as artist, studio technician and house manager. She received her MFA in Studio Art, from the University of Minnesota, Minneapolis, 2011. In that same year Jennifer was awarded a Post-MFA Fellowship from The Ohio State University and has exhibited her work throughout Ohio and the Midwest. She is currently a studio artist living in Bellingham, WA.